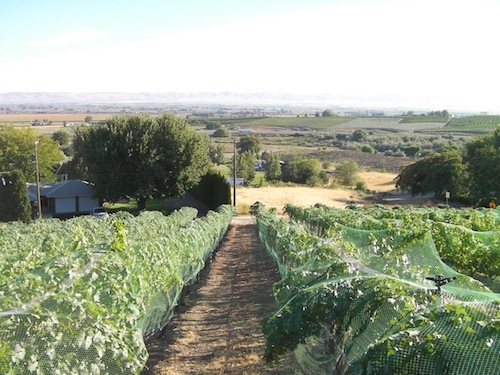 SUNNYSIDE, Wash. – Here on the slopes of Snipes Mountain is the birthplace of the modern Washington wine industry. This is hallowed ground to Todd Newhouse and others who know the story about how a Canadian expatriate had a vision of what Washington could become – then acted upon the dream. William B. Bridgman was the two-time mayor of Sunnyside, a small city in the heart of the Yakima Valley. In 1914, the Ontario native began planting grapes on Snipes Mountain, a 1,310-foot upthrust in the middle of the valley that was named for Ben Snipes, a cattle rancher who lived here in the 1850s. Those first vines Bridgman planted were table grapes, but three years later in 1917, Bridgman planted European wine grapes, including Zinfandel, Semillon, Muscat of Alexandria, Thompson Seedless, Sauvignon Blanc and Carignane, in what is now Upland Vineyard. Today, the Muscat of Alexandria and Thompson Seedless vines – planted by Bridgman himself – remain. The Thompsons, which put out massive clusters, are sold as table grapes, while the Muscat is used to make ice wine. In 1934, after the veil of Prohibition was lifted from the nation’s eyes, Bridgman launched a winery, called Upland. Some of his buildings are still next to those old vines, though they are used now for storage by a local hospital. Bridgman’s dreams of greatness were never quite fulfilled, though he did enjoy a fair bit of success and notoriety. He sold the winery in 1960 to a nephew and died six years later. Upland – which by then had been changed its name to Santa Rosa Winery – closed in 1972. That was the year Todd Newhouse’s grandfather bought Upland Vineyard. 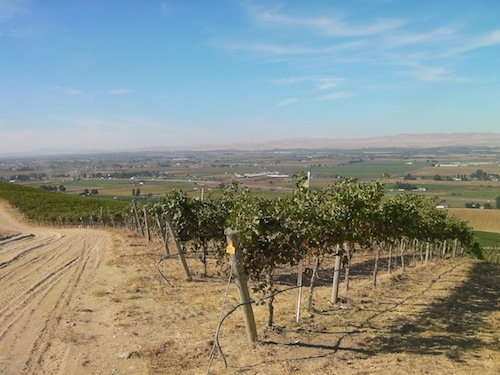 The Newhouse family has farmed the Yakima Valley since 1913, and Alfred Newhouse planted his first wine grapes – Chardonnay and Aligoté – in 1968 on Snipes Mountain. When he bought Upland Vineyard, it had about 100 acres of vines. That has since expanded to more than 750 acres, and the Newhouse family farms a total of 1,500 acres on Snipes Mountain, including tree fruit and Concord grapes. 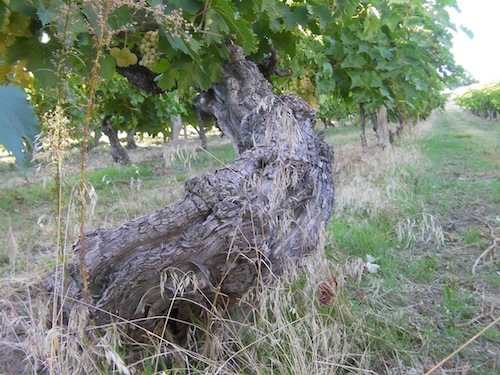 Many old vines remain at Upland Vineyard. Newhouse has blocks of Cabernet Sauvignon and Riesling from 1973, Merlot, Morio Muscat and Chenin Blanc from 1979 and Black Muscat from … well, he’s not sure, but it could date back to the 1920s. Harrison Hill is a small vineyard across Interstate 82 from Snipes Mountain. All the grapes go to DeLille Cellars in Woodinville. The Newhouses also own Harrison Hill, across Interstate 82 from Snipes Mountain but still part of the same landform. Bridgman sold the land to Associated Vintners in the early 1960s, and they planted it to Cabernet Sauvignon and other red grapes. Today, some of those early vines remain, and all the grapes from the 5-acre block go to DeLille Cellars in Woodinville, which makes a highly touted red blend called Harrison Hill. For years, the Newhouses worked in relative obscurity, growing grapes and selling them to such wineries as Chateau Ste. Michelle and Hogue Cellars. But Todd Newhouse, who majored in history at Whitman College in Walla Walla, knew his family’s land deserved something more. In 2006, he launched a winery, calling it Upland Estates to honor Bridgman – whom he calls “the grandfather of Washington wine.” A wine from Upland’s second vintage, the 2007 Malbec, won best in show at the 2009 Tri-Cities Wine Festival. Robert Smasne, owner of Smasne Cellars in nearby Grandview, makes the wine for Upland. He also uses a lot of Upland Vineyard grapes under his own label. Also in 2009, the federal government recognized Snipes Mountain as an official American Viticultural Area – Washington’s 10th AVA. Newhouse worked with Joan Davenport, a soil scientist at WSU and co-owner of Daven Lore Winery in Prosser, to write the petition and shepherd it through the federal bureaucracy. Harrison Hill is included in the AVA. At 4,145 acres in size, it is the second-smallest AVA in the state, just slightly larger than Red Mountain, also in the Yakima Valley. Newhouse has worked on the family farm off and on since the mid-’80s and full time since 1997. Today, he’s the go-to guy for the more than 25 wineries that buy grapes from Upland Vineyard. Of the more than 30 grape varieties he grows, Chardonnay is by far No. 1, and much of it goes to Chateau Ste. Michelle. “They love our Chardonnay,” Newhouse told Great Northwest Wine. Bob Bertheau, head winemaker at Ste. Michelle, concurred. Bob Betz of Betz Family Winery in Woodinville began using Upland fruit in 2009. The Master of Wine was an executive with Ste. Michelle Wine Estates before launching Betz Family Winery. He described the cobblestones on Snipes Mountain as “sweet potato rocks” because of their shape, size and ability to absorb and hold heat. Betz is especially enamored with the Grenache from Upland Vineyard. It is hard to say if Bill Bridgman would have envisioned his early vision earning such respect nearly a century after he put his first vines in the ground. I have a clear one pint wine jar/vintage (approx. 8″ x 4″ x 1 1/2″) with NW UPLAND WINE and the number one (1) printed on the bottom; UPLAND-ONE PINT printed on one side and on the other side – what looks like a coat of arms encompassed by a circle and that is then encompassed with a wreath of grapevine leaves holding a bunch of grapes. Do you have an idea the age of this bottle and if it has any value. We’ll make a couple of inquiries after Thanksgiving. It would help if you can send me a photo of this jar.